Jane Hiebert-White has a special edition of Cavalcade of Risk posted at Health Affairs Blog. In addition to the usual smörgåsbord, she has a special focus on examining risk two years after Katrina. She links to some excellent articles: one on risk analysis; another being a rather depressing account of the state of health care disaster preparation; and another discussing the ways that many of Katrina’s ills simply represent a super-sized version of problems facing the country as a whole, from health care and homelessness to infrastructure and crime. Our thoughts have also been on Katrina. USA Today featured a report on the challenges facing small businesses, which we found quite interesting. Unsurprisingly, insurance tops the list of challenges facing businesses that are trying to put the pieces back together. Since the storm, more businesses — small and large — are underinsuring out of financial necessity, just hoping the next hurricane won’t wipe out their livelihood. In Gulfport, Miss., Jeffrey O’Keefe of Bradford-O’Keefe Funeral Homes has one-eighth the coverage on his five funeral homes and a crematorium that he had before Katrina. Buying more, he says, would be a financial hardship. Even so, his overall premium has risen 45%, to $88,612 a year. While there are certainly opportunities for some business sectors — banks and construction companies are booming — small family-owned businesses are among those that have been hardest hit. As they are in any community, these small businesses were the backbone of the community, and they greatly contributed to the particular character of New Orleans. While nearly one in four businesses is ringing up more sales than before Katrina, almost half of small businesses have 75% or less revenue than before — even with fewer competitors, the council found. Overall, two of every three small-business owners — those with fewer than 25 employees — are bringing in lower revenue than before Katrina, its research shows. Many common business practices need to be rethought in the wake of a disaster. For example, while many small businesses would have qualified for SBA grants or loans, they ran into a catch 22: they needed a home for collateral and many no longer had homes. In another status update at the two year point, Insurance Journal reports that the majority of all Katrina claims – some $40.6 billion involving 1.7 million claims – have been paid. This compares to 790,000 claims in Hurricane Andrew, with a 2006 settlement value of about $22.2 billion. The article also notes that although litigated claims have been prominent in the news, the Insurance Information Institute estimates that fewer than two percent of homeowners claims in Louisiana and Mississippi were disputed either through mediation or litigation. Survival stories are a magnet for many and I am no exception. Whether they be stories of people who escaped death by seconds in the World Trade Center, shipwrecked sailors who spent weeks on a life raft, or cancer survivors who prevailed, there’s something inspiring and fascinating about the indomitable will to survive against all odds. But no prior accounts quite prepared me for the utterly gruesome story of Dave Holland’s survival of a work-related accident. Be warned, unless you are a physician or someone similarly inured to severe injuries, his story of being scalped by an industrial drill is a difficult read. Three years on, sleep still comes uneasily. His head hits the pillow and he flashes back: Caught up in the spinning and metallic screaming and the wet cracklepop sound of tearing flesh. The coppery tang of blood. The thing dragging him closer. The fear and the pain. Beyond the sheer horror of his story, the article resonated on many levels: the medical miracle that was his survival; the window into the fierce will to live that kept him alive; the detailed account of the steep toll of an industrial accident, both when it occurs and in the aftermath; and the case history of post traumatic stress disorder. In reading this, it’s also hard not to wonder about his co-workers. How does one return to the workplace after witnessing an event of this kind? How does one get over the fear of the environment? Dave’s survival may make him unique, but an injury of this nature is unfortunately not unique. I recall sharing a table with claims managers at an insurance trade event a number of years ago, and losing my appetite as they exchanged stories of “worst claims” cases they’d handled, such as scalpings and deglovings. Machine-related injuries are commonly recorded as caught or crushed injuries or the more prosaic contact with objects and equipment. These types of accidents result in about 18% of all work fatalities each year, as well as tens of thousands of injuries that do not result in death, such as Dave’s. In reading other reports of “caught or crushed” injuries, there are some recurring themes: The worker is often working alone. The worker often wasn’t trained to use the equipment, or hadn’t been alerted to the dangers. The worker was often young. The equipment often didn’t have safeguards, or sometimes those safeguards had been manually overridden by either worker or boss. Hair and loose clothing were often the first point of contact. Ponytails and braids are particularly troublesome – a few strands may give way, but a thick plait that is caught could well be a death sentence. There’s not a lot more to say beyond what Dave’s story already imparts: workers, be safe – speak up if you have unease or need training, and don’t work with hazardous equipment while alone. Employers, ensure that your workers are safe – you don’t want a Dave Holland on your conscience. Jay Fishman, CEO of The Travelers, offers an interesting perspective on the current state of hurricane risk. (As the piece appears in the Wall Street Journal, availability is limited to subscribers.) The article is entitled, “Before the Next “Big One” Hits.” That’s ironic, of course, because nothing meaningful will be done until well after the next big one hits. Nonetheless, Fishman’s perspective is worth examining. Fishman looks at the current chaos governing state regulated coastal property insurance from Maine to Texas. Not surprisingly, he sees a lot of problems. With over half the American population living within 50 miles of the coast, with coastal development continuing at an alarming pace, and with the prospect of bigger and more powerful storms developing in our oceans, many carriers are running for higher ground. Fishman believes that they might be more inclined to stay if the rules governing property insurance had some federal oversight. That’s an unusual perspective, coming from a CEO. Fishman recognizes that some coastal risks exceed reasonable rate making. In these situations, he recommends temporary, transitional subsidies, extending 10 or 15 years. Here, those unable to pay the rates associated with the risk would receive a tax credit; on the other hand, those able to pay might face a surcharge to help balance the books. This is Robin Hood in a rain slicker, perhaps, but it’s an idea worth further scrutiny. Fishman is careful to call all of this “wind underwriting.” He clearly is not contemplating an expansion of standard policies to include water damage. (Did someone say Dickie Scruggs?) From his CEO perspective, risk transfer must be both reasonable and profitable. The fact that he welcomes a federal role in developing the rules is a clear indication that the current situation is untenable. The free market for coastal property insurance is floundering on the rocks. Fishman is not alone in looking to the federal government to build the needed lighthouse. Health Wonk Review – Daniel Goldberg is this week’s host of Health Wonk Review and he offers up an abundance of varied links with interesting context and commentary. And while visiting HWR, please be sure to check out Daniel’s excellent Medical Humanities Blog. In today’s posting, he offers a good introduction to the nature of medial humanities as a discipline and the role that medical humanists play in health care. His blog is well worth an extra look-see, encompassing a literature review, a medical humanities lexicon, and an information exchange on events and conferences, among other things. His sidebar links are extensive and also give a good window into the multi-disciplinary nature of medical humanities as a subject matter. Ohio – One of our readers kindly sent us a link to an interview with the new Administrator of the Ohio Bureau of Workers’ Compensation, Marsha Ryan, who says that the state’s $21 billion system is “pretty broken.” She also states that it may take years before public trust is restored, unsurprising in the wake of wide-ranging corruption in the Bureau that led to 16 convictions. She also indicated that she plans to review group discounts that have been offered to business alliances, such as the Ohio Chamber of Commerce or National Federation of Independent Business. According to a recent investigation, some companies were given discounted rates, a practice that raised questions about fairness but which turned up no illegalities. California – In news of another state workers comp body that is seeking to restore trust and transparency, the State Compensation Insurance Fund (SCIF) has named Janet Frank as new president as of October. She will take the reins from interim president Lawrence E. Mulryan who was appointed after the prior president, James C. Tudor, and vp, Renee Koren, were fired. Sally Roberts of Business Insurance reports that there are a number of ongoing investigations to learn if misconduct or illegal activities occurred, particularly in relation to the payment of administrative fees in connection with SCIF’s group insurance programs. More on fraud – On Tuesday, Tom Lynch blogged about a judge indicted for insurance fraud. One of our readers noted that the same issue of Insurance Journal also included another fraud item about four workers comp claimants in Texas sentenced for cheating the system. The four claimants collected a combined total of $17,346 for double-dipping, or collecting benefits while gainfully employed. Unlike the case of the judge, there was no suspension with pay for these folks: Penalties for the four included probations ranging from 1 to 5 years, community service requirements, and restitution. While fraud is certainly wrong and to be condemned under all circumstances, we agree with our reader that the juxtaposition of the two fraud cases and the disparity of the consequences present a study in irony. Presumably, the judge will have his day in court, and if the charges are proven, will have a steeper penalty imposed. Dale Lindemer offers a practical overview of Scaffolding Good Practices in the August issue of Occupational Health & safety – a good resource on “dos and don’ts” to help prevent the most common hazards: falls from elevation; collapse/overturning of the scaffold;being struck by falling tools, work materials, or debris; and electrocution, principally due to proximity of the scaffold to overhead power lines. For unadulterated audacity and out and out gall, Michael Joyce, a Pennsylvania Superior Court Judge, may currently hold the lead in this year’s gold medal competition. Scanning Insurance Journal Online today, we learned that last Wednesday, federal prosecutors indicted Judge Joyce for mail fraud and money laundering, claiming that he cheated the Erie Insurance Group and State Farm Insurance out of $440,000, a charge the judge denies as he protests his innocence. Judge Joyce came to our attention not for what he is accused of doing, but for how he is alleged to have done it. According to the indictment, Judge Joyce, while parked in his Mercedes-Benz sedan in 2001, was rear-ended by an SUV traveling about 5 mph. That’s right, five miles per hour – I’ve crested middle age and I still can run that fast. Following this horrendoma of a crash, no police or medics were called to the scene, yet the Judge asserted that the impact rendered him unable to exercise or play golf for more than a year. He was paid $390,000 by his insurer, the Erie Group, and $50,000 by State Farm, which insured the poor SUV driver. Unfortunately for Judge Joyce, the indictment alleges that, not only was he playing 18- hole rounds of golf shortly after the “accident,” but he was doing it on vacation in Jamaica. It also claims that he was scuba diving, inline skating (I’ve never gotten the hang of that) and working out in his local Gym. The man must be a medical and physical marvel. At any rate, Judge Joyce has announced that, infirmities and indictments notwithstanding, he will continue his run for a second ten-year term in this fall’s coming election. And what, you may ask, did Judge Joyce do with his new-found wealth? Well, according to the indictment, he used it to buy a motorcycle and make down payments on a house and an airplane, which, of course, he intended to fly. We know that, because on the application for his pilot’s license he asserted that he had no injuries or physical problems that would preclude his flying up, up and away, which he then did about 50 times. There is terrible injustice here. We’ll let the courts decide whether it has been done to the Judge, or by him. The most dangerous job in the U.S. – The nation has been following the desperate efforts to rescue 6 miners in Utah, our thoughts are with the miners and their families. The Pump Handle posts about the outreach bySago victims, who are offering support to Utah miners’ families. Wall Street Journal notes that this awful vigil underscores the failure of the safety overhauls initiated last year. And while all eyes are on the Utah situation, Tammy at Weekly Toll reports on 3 miners who died on the job in Indiana last week. Workplace Prof Blog notes that mining is still the most dangerous job in the U.S..
High employer fraud in CA – a new report says that employer fraud in CA is rampant, and may be as high as $100 billion in under-reported payroll. The report studied rates from 1997 through 2002 because there is a significant time lag in reporting rates to the public. The 42-page report was released last week by the Committee on Health and Safety and Workers’ Compensation from the University of California Berkeley researchers Frank Neuhauser and Colleen Donovan. 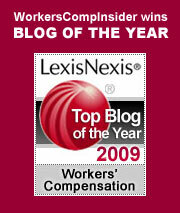 It is the first to quantify the extent of fraud in workers’ comp payroll reporting in California. An article on the fraud report in the San Francisco Chronicle explains how this type of fraud works and how it results in honest employers paying significantly higher rates. “To insure a roofer, he said, the employer may have to pay a dollar in workers’ comp premium for every dollar in payroll. In other words, it costs the honest boss about twice as much per hour to send a worker up on the roof than the paycheck would suggest. But to get workers’ comp coverage for a clerk in that same office, the boss may have to add only a penny in workers’ comp costs for every dollar in payroll. So one easy-to-commit but tough-to-detect fraud, Walters said, is to classify a roofing foreman as a clerk. That person’s cost , instead of doubling, is increased a tiny fraction. But if the fake “clerk” falls off the roof, the insurer still has to pay all the costs of treating them because, under law, the worker is not at fault. Filing deadline extended for NYC Recovery workers – N.Y. extends deadline to sign up for 9/11 benefits. Responders who aided in the rescue, recovery and cleanup efforts now have until August 14, 2008, to register with the New York State Workers’ Compensation Board to maintain eligibility for the federally funded benefits. This isn’t registering for benefits; rather it is putting a stake in the ground to establish eligibility should a need later arise. Many recovery workers are experiencing delayed onset of respiratory illnesses. Health and safety – Good news on the CPR front. The length of time that typical trainings take – 3 to 4 hours – is often a factor that discourages more people from taking the classes. But new studies show that CPR training can occur in as little as a half hour. In preliminary studies, these shorter courses are proving as effective as longer ones. Thanks to Healthbolt for this item, and also for this great link to Learn CPR – You Can Do It!, a collection of online videos and illustrated guides offered in a variety of languages. Workers comp coverage for independent contractors is the issue that just won’t go away. A while back we blogged reform efforts in Delaware, which almost became the first state to require comp coverage for sole proprietors. Almost, but not quite. Delaware has a long-established (and well-deserved) reputation for being a comp disaster zone. That may no longer be the case, as they have implemented far-reaching reforms that should bring down costs substantially. They decided, however, not to become the pilot state for requiring coverage on all sole proprietors. There was a tremendous push-back from independent contractors, who argued (not without reason), that the cost of coverage would be prohibitive. It would put many of them out of business. Delaware, in effect, has chosen to implement the Massachusetts’s solution: allow sole proprietors to choose coverage, but don’t force it. However, when sole proprietors exercise their opt-out option, the burden of their coverage falls unambiguously on the general contractor. At premium audit, Delaware GCs who cannot produce a certificate of insurance with proof of coverage for their sole proprietor subs will be billed for the payroll portion of the subcontract. My guess is that many will try to pass this cost back down to the sole proprietors, who might well end up paying for the coverage they said they cannot afford. 3. The sub must be in a trade distinct from the trade(s) performed by employees of the GC. These recent actions in New Jersey and Delaware are part of a strong national trend. States are determined to crack down on the wide-spread practice of avoiding the payment of benefits in the construction industry: not just workers comp benefits, but social security and unemployment insurance as well. Historically, when independent contractors have been injured on the job, state funds have provided coverage. Now it appears that general contractors are going to be held accountable: when sole proprietors opt out, GCs – willingly or not – will have to pick up the tab. With Congress failing to pass immigration reform, Homeland Security is about to turn up the heat on big businesses. We read in the New York Times that new rules are about to be issued, requiring employers to fire workers who use false social security numbers. Homeland Security is also planning to step up the raids on workplaces across the country. In the chess game that is immigration policy, the pawns are about to get crushed. Here’s how the new enforcement program will work: Social Security will issue no-match letters to large employers where they find a significant number of incorrect numbers. These letters are issued only to employers with at least 10 mismatches, when these workers represent at least one half of 1 percent of the total workforce. Do the math: the enforcement effort is limited to employers with at least 2,000 employees. The key target of the enforcement effort is big business. FOLLOW UP NOTE: Redo the math! A reader points out (see comments) that this new program may well impact much smaller employers, with as few as 50 employees. So the impact is potentially much greater than I originally thought. And as for mistakes in my math, alas, this is by no means the first. Once employers receive the no-match letters, they have 14 days to check for clerical errors and consult with the employees to correct any mistakes. If they cannot come up with a valid social security number, they must fire the employees or face fines of up to $10,000. Immigrant advocacy groups fear the consequences: massive lay offs accompanied by a surge in the “underground” workforce. Add to this the complete absence of safety enforcement for most undocument workers and you have a truly volatile mix. There is an over-arching irony in this situation: most of the undocumented workers who will lose their jobs under this program are performing valuable and valued work. They have taken on jobs that credentialed workers traditionally reject: work that is too hard, with pay that is too low and working conditions that are too miserable. Many of these important jobs will remain vacant. Beyond the misery of the families and communities hosting these workers, we will all see a signficant increase in the cost of living. Sure, it’s trouble for American business. But soon enough it will become trouble for all of us.